When looking at the fractions or pace figures in our running lines, you may occasionally see some fractions colored in red or blue. Red means “fast” and blue means “slow,” but there’s a lot more to it than that. First, the “fast” and “slow” is relative to the final time of the race. Just because the opening quarter time of a race was fast, that doesn’t necessarily mean we’ll code it red. We would only code it red if it’s abnormally fast in contrast to the final time of the race. Second, the red and blue coding is based on the lead horse’s actual fractions. Even if you have your preferences set to show the fractions for “this horse,” or to show “adjusted fractions,” the red and blue is based off of the leader’s actual time. If the shape of the race was particularly fast or slow at any point, we’re showing you a red or blue fraction. While this means that furlongs 3-4 were covered in 24.35 (by the leader), this is not saying that 24.35 is a fast split. It is saying that the first half-mile of the race was especially fast relative to the final time of the race. We welcome any feedback, questions and comments on this feature. Please email us at Support@TimeformUS.com, or post a comment below. OK, to make sure I’m getting this, the adjusted fractions are essentially speed figures, but stated in time, rather than in a Beyer-type scale as with the final times, correct? Thanks again, Marc. That’s right, Steve. Final time speed figures are the final time, adjusted, expressed in figure form. Internal adjusted fractions are the sectional times adjusted, based on track speed, run up, etc. No one’s ever done it and it struck us as madness that it was that way. Why should anyone ever even look at raw fractions when they can be adjusted, with a certain amount of expertise, for track speed? Why do you say “no one’s ever done it”. Quirin did it as well as many others. In a past performance product, if you’re seeing it elsewhere, enjoy Howard! 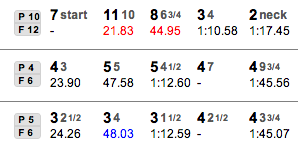 In Beholder’s race on 9/1 at Del Mar, his adjusted fractions are significantly slower than his actual fractions, even though he was on the lead. Does this mean there was a back-wind? Or that his pace is being adjusted based on a track variant? Or that there was an unusually long run up to the gate? Or that the official time is wrong? The fractions are still red whether adjusted or actual. Thanks. Please, any time you mention a horse, include the race#, track and date so we can quickly find it in the PPs. In the case of Beholder’s move to the adjusted 46 and change (from 45 and change raw), it’s simply a matter of track speed that day. It only does you so much good given that he’s on a different surface now, but the point is to give you an “apples to apples” comparison of all fractions, when they’re adjusted, and we absolutely do account for run-ups (and we will catch wind’s impact much of the time). In terms of the fractions staying red, keep in mind these are race shape fractions, per our last blog post on this topic last week. It means the pace call leader when fast at the red numbers, vs the final time. Whether Beholder was ten lengths off the pace or right on it, and whether you’re adjusted or actual, those red number mean the pace of the race was fast early, vs the final time. Fast early=it benefitted horses who came from behind him (whether they won or not). Note subsequently he ran in races that weren’t fast early (vs their final time), and he won.